Safety on the slopes: do you wear a ski helmet? 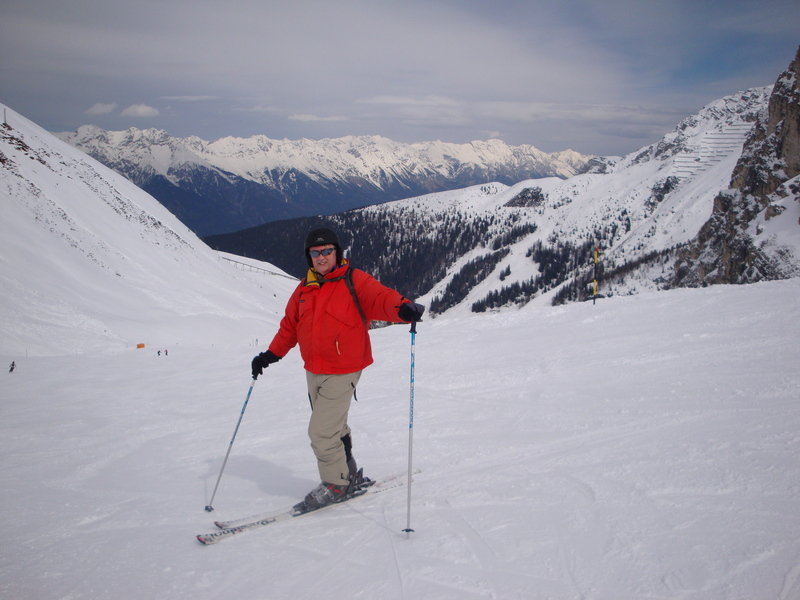 Having booked a skiing holiday for the first time in 10 years, I started to wonder what has changed since I last flexed my supple limbs on the slopes (apart from the suppleness of the limbs themselves) and it became clear that ski helmets are now quite common and a consideration. A natural reaction might be to think that the RoSPA CEO would immediately decide to wear one (it is an inevitable implication of this job that I don’t want to set a bad example), but it’s not quite as simple as that. 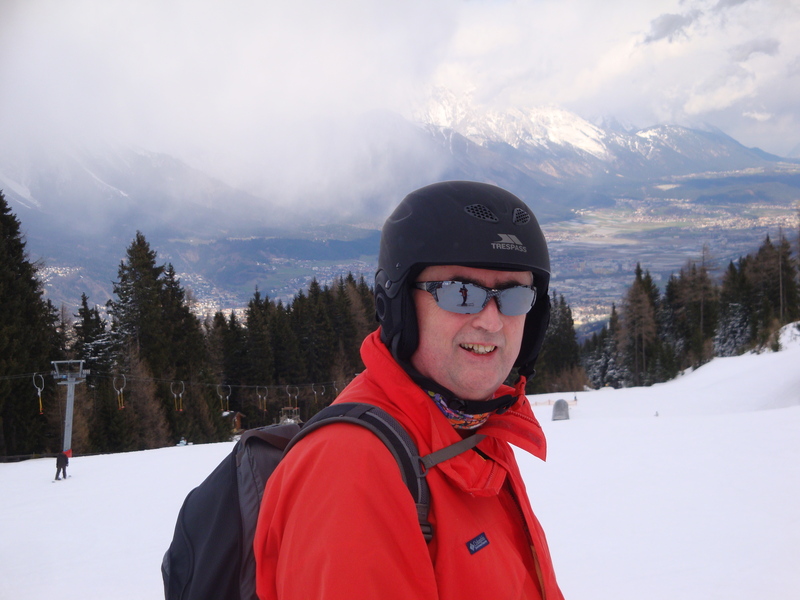 RoSPA’s chief executive Tom Mullarkey on the Olympic downhill run in Axamer-Lizum, Austria. At RoSPA, we invite people to make informed and reasoned safety decisions, we believe that ‘life should be as safe as necessary, not as safe as possible’ and we extol the virtues of a ‘risk assessment’ (jargon for thinking the issues through) – so we should ourselves take a measured and balanced perspective. And if there’s no need to wear a helmet, it would be daft to do so. But I don’t want to set a bad example there either. Let’s look at the evidence ‘for’ wearing a helmet. According to various sources, around 5,000 people suffered a ‘serious’ head injury on the ski slopes in France last year. In Austria, it was estimated that around 150 people (per week during the skiing season) needed hospital attention and in the same country, 27 people have died this season in skiing accidents. What constitutes ‘serious’ was one unanswered question. Whether they were or were not wearing a helmet (and indeed what protection it provided), were missing pieces of the jigsaw. Tellingly, in many countries (including Austria where we went), it is now compulsory for children to wear a helmet and doing a straw poll around the office, it seems that most snowboarders have opted in too. So even if the safety case for a helmet isn’t clear, people are translating the perceived risk into a decision to put one on. A trawl of web advice suggests that professionals such as ski patrols, ski schools etc are generally encouraging the wearing of a helmet (they would inevitably see the consequences of not wearing one more often than the rest of us) and if you’re going to wear one for riding a horse, a bike, rock-climbing, kayaking etc, the potential for head injuries whilst skiing are every bit as high. The friends we were going with, who are not in the safety business, had already acquired theirs and this created a bit of peer pressure. And if you’ve ever seen me skiing… well, I’m at least as dangerous to myself as any snowboarder (snowboarders – please don’t write in). 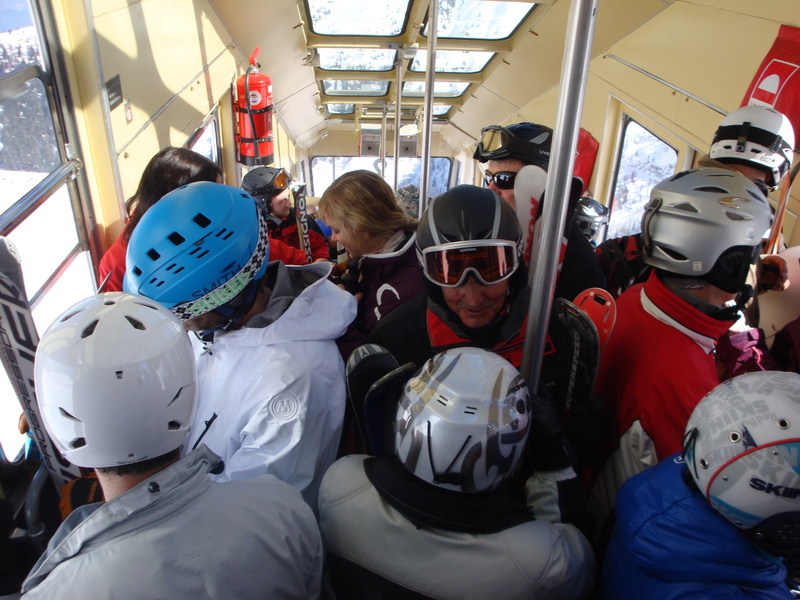 Skiers wearing helmets in the Axamer Lizum Funicular Railway, Austria. On the evidence ‘against’, the clarity is not there either. There’s no compulsion to wear a helmet (although at least one insurer requires it) and it’s also hard to know what value a helmet might bring to you in a collision. Like any head protection, it will probably reduce the severity of an injury up to a certain point. If you hit a tree when going flat out, you may well suffer a serious head injury every bit as drastic as if you were not wearing one. There is also the question of reduced visibility/hearing which might make you less safe. There are practical issues like carrying the helmet out on the plane (although it is possible to rent one in most resorts, if you don’t mind the sweaty liner). And, of course, there is the cost. A low-end helmet costs around £15-£20 but the high end is £60-£200, not inconsiderable for something you might not wear again for another 10 years! But skiing is an expensive business and when a lift-pass costs €150-€250 for the week, and renting the skis and boots in the region of €100-€200, the price of a helmet is ultimately not that significant. Making the judgement entailed a bit more research. There are, I discovered, three standards for ski helmets: CEN1077 (EU variant), ASTM F2040 (US) or arguably the more stringent Snell RS-98. The precise construction and testing regimes of these standards are mind-boggling and overly complex (not really surprising – that’s why we have standards as a shorthand), but having given about as much time to this issue as I willingly would (30 minutes on the web), I decided to treat them all the same. That opened up the whole price range and this, I think, made the decision a bit easier. Balancing up the pros and cons of any safety decision is a matter of taste – how much risk is tolerable. In truth, I was conditioned some years ago in Courchevel by seeing an air ambulance coming in to take away a woman who had been hit by a metal roller from an overhead lift wire. Remembering the bloodstained snow all around her head pretty much made the decision for me: a helmet might not save your life or prevent a massive trauma in the worst circumstances, but it will be likely to reduce the effect of a head injury in most others. I don’t know what my family would think if I had to spend time in a brain injury unit, when the alternative was within easy reach and I just hadn’t used it for some perverse reason. A ski helmet is probably like shin pads. You might not need them very often, but when you do, you’re glad that you had them. “I am persuaded that wearing a ski helmet is a good move, a step forward in personal protection, with people taking responsibility for their own safety…” – Tom Mullarkey. In Austria, we were amazed to find that most people were wearing a helmet – perhaps 80-90 per cent. They could be rented from the ski shop for €15 for the week (but these helmets did not pass the ‘sniff test’) and when I asked the owner of the shop for her thoughts, she said that nearly everyone wears a helmet these days, particularly the locals. Her theory was that modern ‘carver’ skis can flip a skier head-over-heels down the slope much more easily than the longer, straighter ones of yesteryear and this has caused more head injuries, an antidote to which is the helmet. Be that as it may, it is now clear that if there is a clash of heads on the slopes, the person without the helmet will come off worst – perhaps a self-fulfilling prophecy? I do wonder whether once the majority have chosen to wear one, the minority are forced to conform, just to protect themselves. I am persuaded that wearing a ski helmet is a good move, a step forward in personal protection, with people taking responsibility for their own safety, rather than just relying on chance, the prompt arrival of the ‘bloodwagon’ and their health insurance. But these considerations aside, snow conditions were perfect, the weather was superb and if anything, a 10-year gap has made the whole thing a bit less of a competition and a little more about style and relaxation. It’s like riding a bike – you don’t forget how to do it. Oh, and you wear a helmet! Couple of key points – first day I wore one I and another skier, also in a helmet, collided pretty badly. We were on a narrow convergence. Lack of side visibility and perhaps loss of some hearing. However, I suspect they do help in a bad fall, I bought mine after one. In any case, they are warm.